Disney Rock Cabins conveniently located just after the Pensacola Dam on highway 28 is perfectly located in the middle of all the action with competitive pricing. Disney Rock Cabins conveniently located just after the Pensacola Dam on highway 28 is perfectly located in the middle of all the action with competitive pricing. 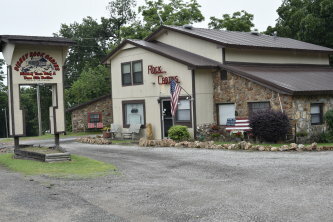 Whether you like golfing, fishing, cruising the lake, off roading, rock crawling, or love taking the family to visit any one of South Grand Lake’s Cherokee State Parks or Recreational Areas, these individual rock cabins are just minutes from all those options with Pistol Pat’s savory BBQ and ice cream shack right across the street! Easy access to boat ramps nearby with plenty of parking available for trailer and ATVs. The Disney Rock Cabins are truly a Historical landmark and was built from the same rock that created the Pensacola dam in 1938. In addition, the new owners, Mike and Kathi Black, kept the integrity of its historical roots but renovated the facilities to give the cabins a clean and updated appeal. These little cabins offer a different style of staying in the Grand Lake area with a quiet serene location. The cabins are surrounded by shaded areas with a covered pavilion that provides picnic tables and benches, as well as grills for charbroiling. The Disney Rock Cabins feature bathrooms, showers, sleeping quarters, cable television, linens, heat and air, refrigerators, and even microwaves. For more information, feel free to call us at 918.435.4540.